Design & People | "Ba-Bapu: 150 Years"
GOOD design produces good results when art merges with the need to connect people, touch their lives and add value to it. Associates of Design & People work tirelessly and voluntarily with the intent of making good design and communication technologies available for grassroot level organisations working for the benefit of the common man. Design & People fills the need by making good design for the deserving organisations and institutions and helping them reach both the people in need and those willing to help. This time in the event of 150th birth anniversary of Mahatma Gandhi (1869-2019), Design & People felt duty bound to create a logo to remind people of the message of the Bapu at a time when violence have become common in our daily lives. "Ba-Bapu: 150 Years" logo was developed for Mumbai-based Mahatma Gandhi Foundation (MGF) led by Tushar Gandhi, the great grandson of Mahatma and Kasturba Gandhi. 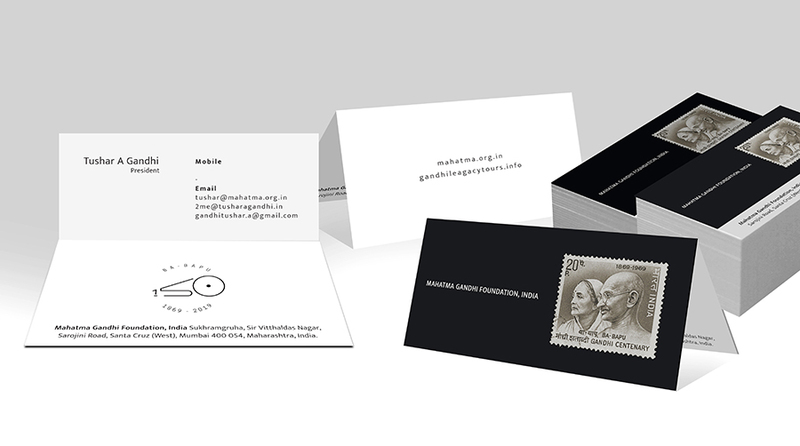 The Mahatma Gandhi foundation, India works chronicling and spreading the Gandhian values and principles in the society. When asked about the work done by Design & People, Tushar Gandhi said he is extremely grateful to the organisation for designing the logo and stationary for Mahatma Gandhi Foundation and for helping convert his ideas into an appropriate and beautiful reproducible artwork. He also appropriated the excellent use of the Ba-Bapu stamp published by the Indian Post on the occasion of the Ba-Bapu Centenary in 1969 as the logo of MGF India and coupling it with a beautifully and cleverly designed logo for "Ba-Bapu: 150 Years". He opinioned that "turning the 150 numerical to resemble a stylised Charkha is clever. Although designed to commemorate 150 years of two great individuals, the logo stands to represent the eternalness of their ideology and practice. The bond of the small wheel with the big one represents unity and interdependence of life." 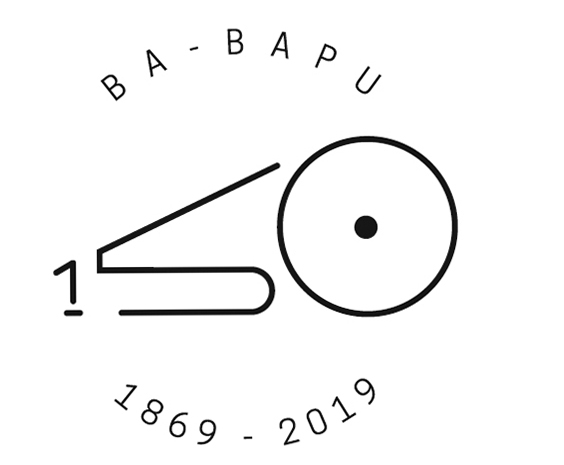 "Ba-Bapu: 150 Years" anniversary logo and stationary were produced by Santosh Kangutkar, a Mumbai-based designer who is also a Design & People Associate. As a person who grew up learning about the sacrifices made by Indian freedom fighters, Kangutkar visited Gandhi ashrams and institutions regularly. This curiosity and interest helped him to work on the prestigious National Salt Satyagraha Memorial at Dandi, a project of Ministry of Culture GoI, implemented by IIT Bombay. When asked about his contribution in developing the anniversary logo, Santosh Kangutkar said "working on this project gave him inspiration, motivation and happiness." A week before the work started, Santosh decided to visit the nearest Gandhi Ashram in Mumbai in order to have a first-hand experience on a Charka. There he started visualising the stylised number "5" in the thread which rolled on to spinning wheels to create "0" and the stand holding small wheel as number "1" — as clearly described by Tushar Gandhi in his Design Brief. Elaborating on the theme of Charka, Tushar Gandhi said: "the Charkha today has come to represent the idea of India of the ancient and the modern, of unity in its diversity and of the fabric of its humanness — Khadi. The Charkha in the "Ba-Bapu: 150 Years" logo represents the Charkha that independent India discarded from its flag and in doing so lost its soul." "The Charkha is an inseparable identity of both Ba and Bapu also symbolising their belief and practice of Swadeshi. It symbolises truth, simplicity, unity, the power of one, emancipation, enterprise, tradition and dignity of labour. The wheel also symbolises eternal time and our ecology in its representation of Mother Earth 'Ba," he added. "Ba-Bapu: 150 Years" anniversary logo will be used to connect with people in a series of events planned by the Mahatma Gandhi Foundation from 2018-2019. Let Bapu's message of the truth and non-violence be remembered forever!